A view of the Atlantis space shuttle after docking with the International Space Station on Feb. 9, 2008. Thisstory was updated at 7:33 p.m. EST. HOUSTON— NASA delayed a planned Sunday spacewalk outside International SpaceStation (ISS) because of medical concerns with a crew member, mission managerssaid. Seven shuttleAtlantis astronauts docked with the ISS Saturday afternoon and began preparingfor tomorrow's installation of Europe's new Columbus science laboratory. But JohnShannon, deputy shuttle program manager here at NASA's Johnson Space Center(JSC), said medical problems with an astronaut prompted the agency to delay the seven-hourexcursion. NASAextended the 11-day mission by one day and may extend it yet anotherday, Shannon said. "Thecrew called down for [a private medical conference] during the rendezvous,which was a little bit of a surprise to us," Shannon said, referring to the docking of Atlantis with the International Space Station (ISS) today. The spacewalk is now scheduled for Monday. "It's not going to impact any objectives of this mission," Shannon said of the crew health problem. "It will cause us to rearrange a few activities." Shannonnoted that Hans Schlegel, a 56-year-old European Space Agency (ESA) astronaut slatedto participate in the first spacewalk of theSTS-122 mission, will be replaced by mission specialist Stanley Love, 42,for the event. Mission managers are still deciding whether or not Schlegelwill participate in a second of three planned spacewalks with mission specialist RexWalheim. When askedfor further details about the medical problem, Shannon said it was not lifethreatening but would not tell reporters what the concern was or who wasaffected by it. "Youguys can fish all day, but I won't bite," he said, explaining that medicalissues are private matters and are not subject to public disclosure by NASA. Inquiriese-mailed by SPACE.com to the ESA about the status of its two astronautsin space — Schlegel and Leopold Eyharts — were not returned by thetime of publication. Claims by wire reports suggesting Schlegel lost his voice,a critical function during a spacewalk, were not substantiated by NASA. Aside fromthe undisclosed health trouble, lead shuttle flight director Mike Sarafin saidteams on the ground are busy scrutinizing photographs of Atlantis' heat shield taken today beforeit docked at the Harmony node. A small tear in a thermal blanket on therear of Atlantis was given special attention during the procedure. "Youcan just barely see alittle tear," Sarafin said, pointing to an image of Atlantis' rightOrbital Maneuvering System (OMS) pod. "It's probably not that big of anissue but we're off looking at it." Sarafinalso noted that a backup computer on Atlantis' suffered a glitch and wastaken offline. "Wesuspect that it's a healthy computer, we just took the precaution to notpollute the other computers by bringing it back in," Sarafin said,noting that two other computers remain to perform the orbiter's guidanceand navigation tasks. The STS-122mission, led by commander Stephen Frick, is slated to install the ESA'sColumbus laboratory, outfit the new orbital room and replace an emptynitrogen tank. Atlantis is expected to land on Feb. 19, possibly Feb. 20 if thesecond day is added to the mission. The 100-tonorbiter has enough supplies to remain in space until Feb. 21 or Feb. 22 ifAtlantis' fuel cells are adequately conserved, Shannon said. NASA isbroadcasting Atlantis' STS-122 mission live on NASA TV. 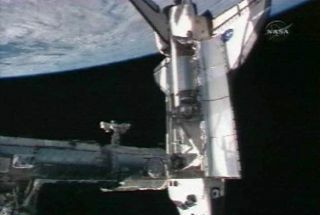 Click here for SPACE.com's shuttle mission coverage and NASA TV feed.